Well, I am not gunna sugar coat it, all in all, not our best game. But hey, it is the 1st game of the year and we are still working in some new pieces. I think the end of the game put a sour taste in our mouths, but we saw a lot of great things yesterday that I think this team will build on. First of all, Isaiah is a beast. A cool 25 pts and 9 ast. A decent night for the little guy. Not only was he making the shots and scoring, but he was a MONSTER on dishing the ball and setting up his teammates. The scary part is that he even started the game off a little slow! I think Isaiah is going to have a break out season even better than his break out season last year. And the reason I think this is going to be true is partially because of Al Horford. 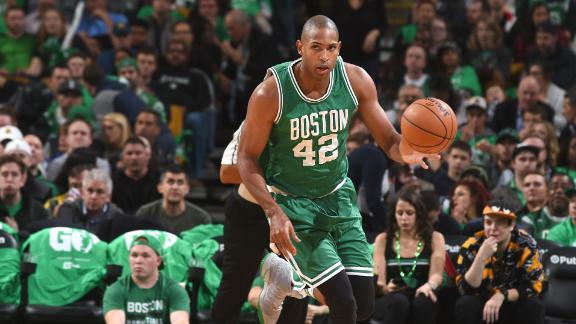 Horford is sooo good in the pick and roll with IT and it is going to be so lethal. Horford spreads the floor and will allow Isaiah to get to the basket with ease which is already one of his strengths. Try to stay in front of Isaiah, you can’t. Speaking of Al, he had his debut as a Celtic last night and boy did he look good. He is going to be such a big upgrade over Sullinger this season and I think it is going to really show. Like I said, he is amazing with the pick and roll. He is great defensively and can guard multiple positions. AND he has a great post game and outside game. I mean, just look at his 1st points as a Celtic. AL’S GOT RANGE! He was a beast all night and looked so solid. His play isn’t going to jump out at you but he is going to make a bunch of solid plays and will be such a dependable player. He finished the night with 11 P – 6 A – 5 R, oh yeah and this block. Another player who had a great game was Jae Crowder. Jae was hitting all the big shots early in the game and was a constant producer through the rest. He scored 21 pts with 9 coming from behind the arch. He is such a solid 2 way player and I really think he is going to be in that All Star consideration this season. His defense is just too good. I mean look at this play last night, this is what you get from Jae night in and night out. I was also very happy with what I saw from Jaylen Brown in his pro debut. He looked like a guy that has been here before and didn’t look shook at all. I still can’t get over how aggressive he is by taking everything to the hoop, and I am not complaining at all. I love it. Not only is he athletic enough to rise up and put it down, but he also has such great moves in the block. Hell, he almost murdered a couple of Nets on some of his dunk attempts. He is going to get to the line so much this season, which is why the most important thing for him to fix is his free throws. He is still missing some and that needs to be first on his list of things to tweak. Overall I was happy with his game. He played 19 mins and ended the night with 9 P – 1 A – 2 R.
Yeah, it sucked that we had problems closing out the game. We were up 23 with around 5 mins left and let them come back to down by 3 and they had the ball. That cannot happen. Ever. Especially to the Brooklyn Nets. Listen, we need to work on it, thats fine. A lot of those guys in the 2nd unit that let them come back are young, and aren’t used to their role yet. And when the starters went back in and struggled I am going to chalk that up to them all being cold and not expecting to come back in the game. Brad said something last night that I love. It was something along the lines of “you aren’t a top defense just because people say you are” which I love. This needs to stick in this teams head. Yes, they are one of the best defensive teams in the league, but the reason for that is because of their grit and hustle. They grinded last season and never let up and thats what made them such a force defensively. Now that you finally are getting some recognition you can’t take it easy, you got here by never taking a play off and you will only stay where you are if you keep that up. Anyways, a win is a win. Hell, we dropped games to the Nets last year so there is no reason to worry. Tonight we have the Bulls which should be a great game. The Celtics were dominate last season on back to backs so lets see if the trend continues. The Celtics are ahead of the Warriors in the standings and the Warriors are tied with the Nets in last place. Let’s get after it tonight. C’s up.